Fruits and vegetables are plant foods. Plant foods basically can mix except that the juice texture may be different which may cause the juice to not taste so good, but they don’t harm you. When uncooked, plant foods all contain the same basic nutrients: enzymes, vitamins, minerals, bioflavonoids, phytonutrients … so why can’t they mix? In fact, mixing them gives them the synergistic power to work together as a super booster! What other health benefits to green juices you ask? Please look up vegetable juicing. If you’re new to juicing, please read the Juicing Basics page first. This chart is just a very basic guideline to start you off on making a nice-tasting green juice. Once you’ve tried any of these various combinations, you’ll be more confident to experiment on your own. The combinations are endless. Later, you may want to add more ingredients to the juice, or less. It’s totally up to you. There’s no hard and fast rule as to what you can put into your juice. How To Make Green Juices Perfect—Always! 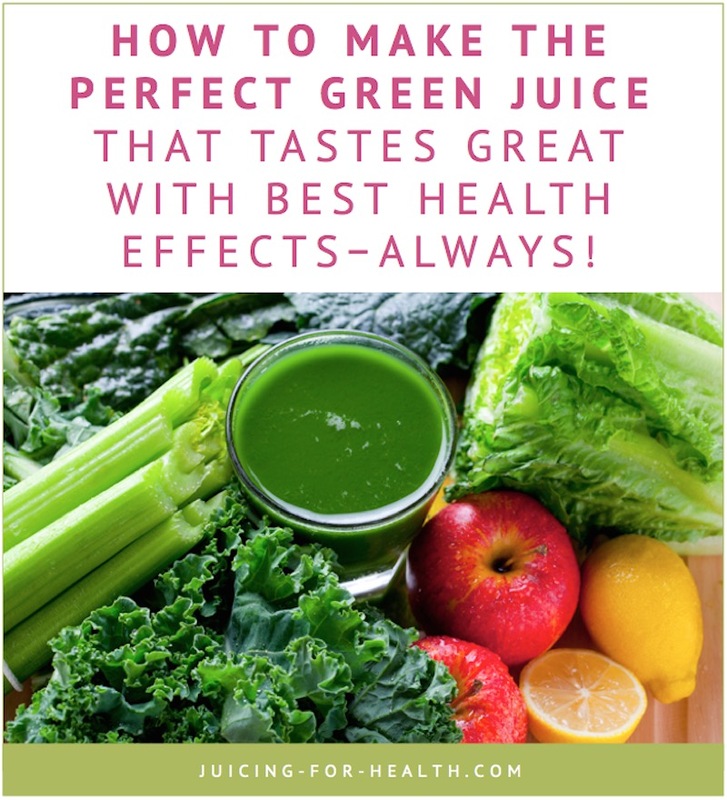 = Great-Tasting Green Juice !! The vegetables suggested below are to be juiced raw (uncooked). To learn more about the health benefits of each fruit/vegetable, click on their links. Firstly, decide which BASE you want to start with. Green juices doesn’t necessarily mean you have to use ONLY green vegetables. You can also have other colored vegetables and fruits in smaller amounts. In fact it is encouraged, for you to use other “colored” vegetables—red, purple, orange, yellow—for their different phytonutrients. Here are a few suggestions. These all make one portion. Adjust the amount accordingly to make your desired amount. This is my personal favorite as I find these two items mix very well with almost anything at all. Even with greens, it adds a nice sweetness to it without being too overpowering. Very easy for beginners to transition to fully green. This base is best if you want to make just green juices without the sweet carrots. This combination alone is nutrient-densed, supplying electrolytes and the right sodium to your juice. Great juice for athletes or if you work out/perspire a lot. 8-10 kale leaves and 6-8 ribs of celery. ¼ head of cabbage and 6-8 ribs of celery. ¼ head of cabbage and 4-5 branches of broccoli florets. 8-10 Brussel sprouts, 3 red or yellow capsicums and ½ a lemon. 6-8 collard green leaves and a bunch of spinach, with ½ a lemon. ½ big or 1 small bittergourd and ½ a small pumpkin. 2-3 heads of Romaine lettuce and 12-14 sticks of asparagus. 1 medium-sized jicama and 1 section lotusroot (~6 inches). A bunch of spinach and 2 red/yellow capsicums with ½ a lemon. 2-3 heads of Romaine lettuce and ½ head of cauliflower. 4-6 medium-large beetroots and 1 lemon. 1 large grapefruit and 2-3 tomatoes. (Not a green juice but suitable for diabetics). 2 medium-sized sweet potatoes, and 6-8 carrots. 1 small fennel bulb and 3-4 green apples. So take Base # 1 or 2 or 3, + ANY of the main ingredients (any 2 items) above. To make it more interesting, + ANY of these optional items below to complete the taste, if they’re not already in your recipe. These items are somewhat strong and even pungent, so use sparingly, or just omit if you don’t like the smell/taste of them. One of the superb qualities of these foods is for helping to balance your intestinal flora. It helps reduce the harmful bacteria and increase population of the beneficial bacteria. So there you have it, an endless list of green juicer recipes that you can make by mix matching. Experiment with the amount according to your taste. Keep it simple and uncomplicated. Get more green juice recipes. Bookmarked your site. Again, thanks for great chart very useful. Thank you so much for this Interesting Site..great recipe ideas. Amazing site! thank you so much for the abundance of great information for us beginner juicers. I am so happy I’ve come across your site. It has such valuable information, thank you for sharing!!! Sara, this is an amazing site. I run juice programmes in Ghana and your site is awesome. I will be forwarding your link and also make reference to your site in my new book on juice cleanse. Amazing site! I love reading the ingredients you use. Will try them soon, and after that will give you feedback. This is very helpful for everyone. Especially for those who need to better their hemoglobin red blood cells for female and children. I am very thankful for this beautiful information to improve health. As a chart that should have been! Very informative for a beginner. Can I start with using my blender before buying a juicer? Love this article as well as your website. This “guide” is helpful not only for beginners but for those more experienced with juicing as well. It would be great having this in a printable document.